In the late 1850s, Denver got its start and assembled the key ingredients that would enable it to thrive instead of becoming the ghost town that so many other Western boomtowns did. The keys to success: gold discoveries, land speculators, civic boosters, transportation routes and political deals. Gold was first found in what would become Denver in 1849 and 1850 by fortune seekers on their way to the California Gold Rush. The small amounts of the precious metal that they found in streams of the South Plate River failed to measure up, and they left for California. What put the Denver area on the map, however, was a substantial gold find by William Greeneberry “Green” Russell, a Georgian who had worked in the California gold fields in the 1850s. Russell heard about the 1849 gold discoveries in the South Platte watershed through members of his wife’s Cherokee tribe, and he left Oklahoma with his two brothers and six companions in 1858, reaching the Denver area in May. Russell and a cousin, Sam Bates, found a small placer deposit near the mouth of Little Dry Creek in modern-day Englewood that July, and it yielded about 20 troy ounces (622 grams) of gold – the first significant gold discovery in the Rocky Mountains. News of the gold strike spread rapidly, and 100,000 gold seekers flocked to the area by 1861 in what became known as the Colorado Gold Rush or the Pikes Peak Gold Rush. With the miners came land speculators, notably William Larimer in November 1858. Larimer and his partners in the Denver City Land Co. staked a square-mile claim on the hill overlooking the confluence of the South Platte River and Cherry Creek and began selling parcels of land to miners and merchants. Larimer named the settlement “Denver City” to curry political favor with James W. Denver, the governor of the Kansas Territory, in hopes that it would become the county seat for the territory’s new Arapahoe County. What Larimer didn’t know was that Denver had already resigned as governor. Larimer, however, had founded Denver City on the St. Charles Town claim, and he and his partners had to convince a St. Charles Town Co. representative to surrender his claim to Denver City’s. The persuasion: a barrel of whiskey, and a threat of hanging. The fledgling Denver City quickly became a frontier boomtown, filled with shacks, shanties and log cabins, plus teepees that were the seasonal homes for the Arapaho tribe led by Chief Little Raven, who had welcomed the whites to share his camp. The mining camp was a rough-and-tumble place, with saloons, brothels and gambling parlors built to serve the miners. Larimer’s Denver City claim was across Cherry Creek from Russell’s claim and an emerging settlement of Auraria, which Greeley thought had better prospects. The gold deposits in the Denver area, however, were of poor quality and soon became exhausted, which threatened the area’s future. But prospectors in early 1859 found rich gold deposits in the mountains to the west, in what became Central City, and that set the stage for Denver City to take on a new role, as a supply center and transportation hub. Denver City took a major step in that direction in May 1859, when it secured the region’s first overland wagon route, offering daily service for “passengers, mail, freight, and gold.” Denver, however, missed out on the routing of the transcontinental railroad, which instead passed through Cheyenne, Wyo., about 100 miles to the north. 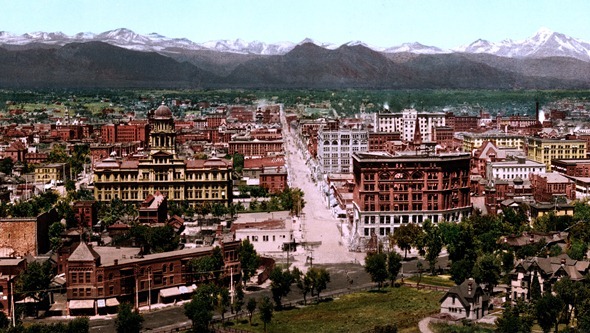 Civic boosters, however, succeeded in getting Denver City and Auraria to merge in 1860 under the name Denver City and in winning Congressional approval a year later for the creation of the Colorado Territory, with Denver City as the Arapahoe County seat. In 1867, Denver City was selected as the territorial capital and shortened its name to Denver. The territory’s second governor, John Evans, was a wealthy railroad investor and recognized that Denver needed a link to Cheyenne and the transcontinental railroad to ensure its future. He secured the federal land grants and county bonds needed to build a Union Pacific Railroad line from Cheyenne to Denver, which opened in 1870. Denver boomed again in the 1870s and 1880s with the discovery of large veins of silver in the Colorado mountains, and that spurred the rise of prostitution, gambling, crime and underworld bosses at the same time that the city was building a stronger economic base with manufacturing, transportation, government and trade. The city’s population grew from about 5,000 in 1870 to 106,713 in 1890, which ranked it behind only San Francisco in the West. The silver bust of 1893 plunged Denver into a recession, but the city recovered and managed to double in population to 256,491 in 1920. Denver’s economy continued to be dominated by its role as a transportation hub for minerals and agriculture until World War II, but its manufacturing sector expanded after the war with specialized manufacturing. The city acquired state lands for the park system that was developed by Mayor Robert Speer in the early 1900s as part of the City Beautiful movement, notably Washington Park, Cheesman Park, City Park and the Civic Center Park that links the city-county government center with the state capitol. Denver also bought land for the Red Rocks Park centered on the famous Red Rocks Amphitheatre in the western foothills, and the hill on which the Winter Park Resort ski area was built in Grand County, 67 miles west of Denver. Mayor Benjamin F. Stapleton completed the downtown Civic Center and began construction of the Denver Municipal Airport on the city’s eastern edge, which opened in 1929 and was named after him. The Stapleton airport was torn down after the city built Denver International Airport northeast of the city, which opened in 1994. Denver hosted the Democratic National Convention in 1908, with William Jennings Bryan as the presidential nominee, and again in 2008, with Barack Obama as the nominee. Denver was selected in 1970 to host the 1976 Winter Olympics to mark Colorado’s centennial. But Colorado voters in 1972 rejected ballot measures that would have provided the public funds for the games, and the Olympics were moved to Austria.